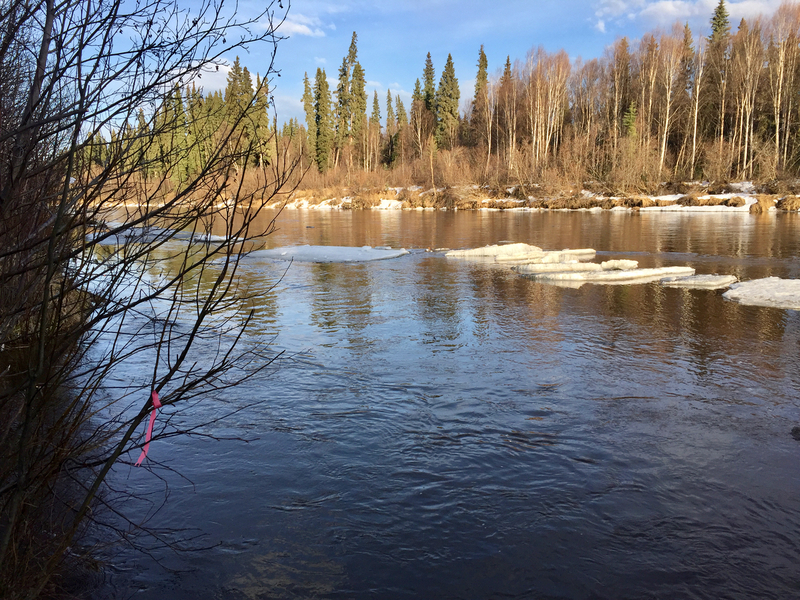 Update – May 3 – The 2017 Annual Paddle and Potluck trip on the upper Chena River scheduled for Saturday, May 6 has been postponed due to river and ice conditions. As of 8 p.m. Tuesday, May 2, 2017 the Upper Chena is at a high, bank full level with considerable shore ice on both inside and outside banks at a number of places visible from access points. 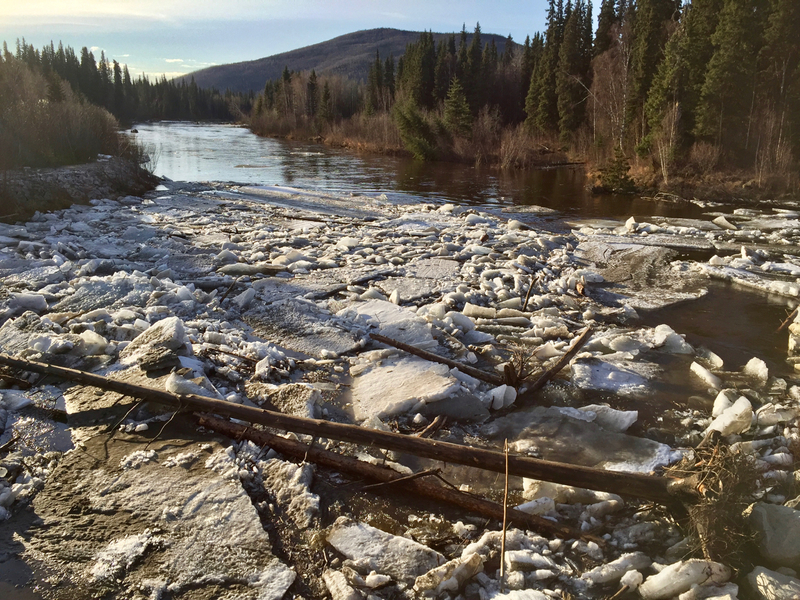 You can drive to the gravel bar at first bridge, but there is a large impassable ice and log jam on the upstream side of first bridge. The 31.4 mile access point has only a very small eddy with swift current along upstream and downstream shorelines and ice chunks hung in shoals just off shore. It would be a challenging takeout for a large group. There was open channel at points visible from the road, but potential for large ice jams on tight bends or log debris. Ability to pull out and portage on either bank could be limited by ice. Upstream at 3rd bridge, a main channel is open, but there is a good bit of ice that will be flushing downstream as the river rises. The gauge at Second bridge at 40 mile has been steadily trending upwards with some diurnal cycles over the past week. Given the amount of snow and ice in the forest, adjacent sloughs and surrounding hills, combined with the short term forecast,levels can be expected to continue rising over the next several days. Conditions could make recovery from or rescue following a capsize, swim, broach or pin both difficult and dangerous, even with full drysuits. Given the large group size and mixed experience levels of last year’s Paddle and Potluck group, river and ice conditions do not provide a good scenario for a safe and uneventful outing. To reschedule the Upper Chena Paddle and Potluck, we need a member to take over as trip coordinator, as John is unavailable for other weekends in May and early June. We will launch at the first bridge (approximately Mile 37 Chena Hot Springs Road) and take out at the mile 31.4 river access (the Nugget Creek winter trailhead). Meet at the First Bridge at 10 a.m. (Look for the big gravel bar on river right downstream from the bridge, accessed by signed dirt road on the right just before the bridge, then left at the fork out to the gravel bar). It takes about an hour to get to the first bridge from downtown Fairbanks. We’ll unload gear, run shuttle vehicles down to the take out, and launch. Plan to have lunch on the river and be at the take-out by late afternoon. This section of river is suitable for canoes, kayaks, packrafts, inflatable kayaks, or small rafts. We will pack lunch dishes, a small propane grill, collapsible table and minimum impact picnic gear into the boats and have our potluck on a gravel bar along the river. Be creative. Kayakers and pack rafters may wish to coordinate with canoeists to help carry bulkier “luxury” items like camp chairs or coolers. The trip will occur rain or shine. To come on this trip, you will need to be a current FP member ( Join or Renew online, or bring cash or check to the put-in. 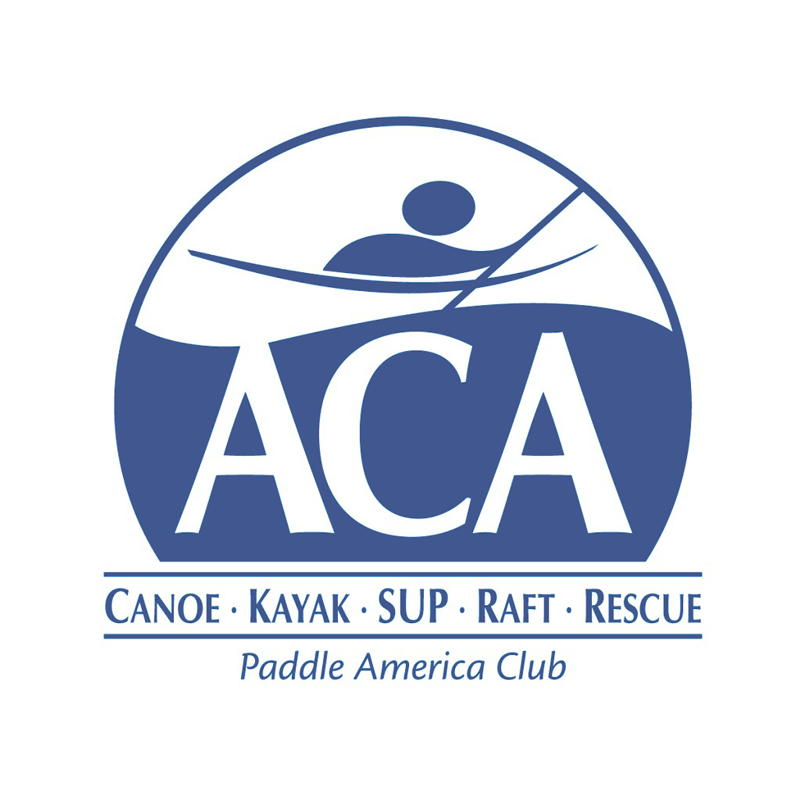 We’ll also have membership applications/renewals at the put-in), wear a PFD, carry spare clothes and rain gear, and be at least an advanced beginner paddler with experience in swift water and the ability to confidently maneuver a boat to avoid sweepers and strainers. 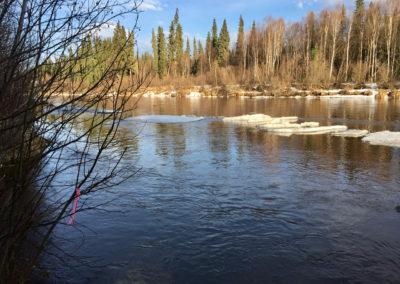 In recent years a there have been channels obstructed by logs just upstream of the takeout in the vicinity of the Chena River Public Use Cabin. 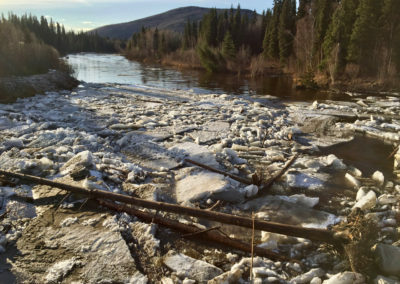 The Upper Chena is Class I. Woody debris obstructing the river channel constitutes the main challenges. Skills to recognize hazards, maneuver in swift current, and avoid sweepers or logjams are essential for a safe trip. Please let trip coordinator John Schauer know if you plan to attend by noon on Friday, May 5. (907)457-3962 or johnjschauer (AT) gmail (DOT) com. If you leave a message, please state how many are coming with you and the number and type of craft that you plan to paddle.